From fruit bar to grown-up slushy drinks…. Are you a popsicle and fruit bar person? We are. We LOVE us some popsicles in the summer, spring, winter, anytime…in fact it could be 5 degrees outside and my kids would ask for popsicles. With all of the food allergies and sensitivities in our house, we can’t do corn syrup or food dyes. And it’s hard to find a popsicle or fruit bar without corn syrup products in them. Believe me, we’ve tried. We actually prefer the Edy’s Outshine bars don’t have any of that junk, are made with real fruit juice. Otherwise, our other option is organic popsicles and $10 for 4 bars isn’t really an option. I at least know the kids are getting some fruit in their snack too for a treat. I am hooked on the Black Cherry flavor. And if you melt it in a glass for the kids , it makes a yummy slushy. Sometimes I will melt a few together and let them mix flavors and they end up with a tropical fruit slushy. 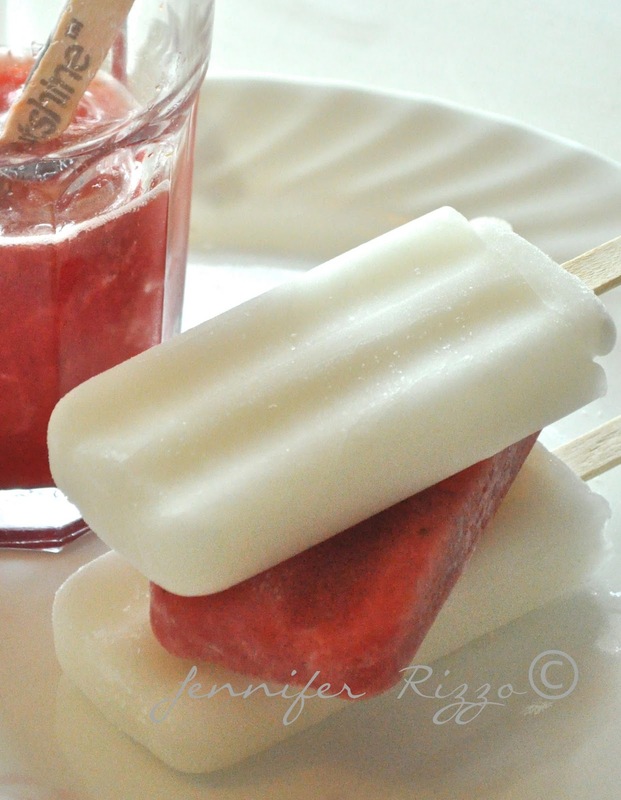 Below here are some grown up frosty drinks from popsicles! Summer has to be yummy for the grown ups too! yum, does a gelati count? thanks for offering this! I enjoy ice cream, chocolate is my favorite. I am going to have to look for these pops here. Until today, I had not even heard of them. This is probably because my husband does the bulk of our grocery shopping. I am learning a lot from my blogging friends. Thanks for your tips on using these, Jen! I love strawberry Italian ice! I love cherry Italian ice. Oh, my goodness! We live within 10-15 miles of an Edy’s Company. And I’ve tasted these bars. They are fantastic. Hard to beat. I do like D.Q. Blizzards….my favorite being a Heath Bar made with chocolate ice cream. Yum! Anything frozen is such a treat in the summer, but these fruit bars are my favorite – especially berry-flavored! No guilt! Homemade fruit smoothies in our Vitamix. I’ve been a fan of Edy’s fruit popcicles for a long time…. I buy the smaller size (1.5 oz) pops and have them in my freezer all year round. I love a glass of lemonade in the summer time! Ice cream is my favorite!! I don’t have a specific flavor, basically ANYTHING will do! I love ice cream! And and the lime Outshine is my favorite! Not a huge ice cream fan, so give me a Popsicle and I’m a happy girl! My weakness is ice cream. Any flavor, anytime! The Outshine bars look yummy too. I must try them!!!! Especially the coconut and strawberry! LOVE frozen fruit bars or smoothies!!! Spot on! I love Edy’s fruit bars. Pineapple isn’t easy to find in treats. I’ll be looking for them locally. Edy’s regular Acai Blueberry fruit bar is a favorite. Can I still win if I say ice cream? Can’t have much, but it’s perfect in the summer. A good ol’ chocolate ice cream cone does it for me! I love a thick chocolate malt. Ice cream cones are usually my favorite. But, these really sound so good and love that they’re low in calories. We are big fans of frozen fruit bars and frozen yogurt. My favorite is ice cream. I typically like ice cream twist in a cup. but outshine sounds great! Never tried it before. Ice cream is totally my fav! I love orange sherbert during the summer months. I adore gelato, but these bars would be a healthier alternative. I love mint chocolate chip ice cream. My aunt and uncle have a local custard shop, and we love it! definitely a push pop! Yummy! strawberry ice cream for me. I love homemade peach ice cream, but I’ll definitely try Outshine peach bars! I love frozen custard in the summertime! Yummo! My favorite frozen summertime treat- fruit smoothie. I like frozen yogurt with strawberries. My favorite treat is a popsicle! Fruit pops like Outshine bars are my favorite. So refreshing and not too heavy in the heat. When I was pregnant with my daughter, I had morning sickness really bad for a while. Fruit pops were about all I could eat up until evening time. Such a blessing! I like watermelon in the summer! My favorite summertime frozen treat is home churned ice cream. B & J’s Cherry Garcia Frozen Yogurt. I love Popsicles in the summer, or ice cream sandwiches. I love to indulge in a peanut butter cup blizzard, but these fruit bars sound like a much smarter choice. I haven’t sampled them (yet) but would love to give them a try. I just bought the Peach flavored Outshine bars…I can’t wait to try them! My favorite summer time treat is honestly the Strawberry Edy’s Outshine bars! I have also added the coconut to the freezer. I love fruit bars or smoothies. My favorite frozen summertime treat is chocolate ice cream. It might change after I try these Outshine bars. 🙂 They sound delicious and refreshing. just what I needed now. I love frozen blueberries – thank you. Those photographs are making me want an Outshine now! Either these Outshine bars or ice cream are my two favorite frozen summer treats! Frozen melon balls have always been a favorite summer treat for me. It gets very hot here and a cold smoothie is just the way to go. Nothing like an ice cream sandwich. I love to have frozen lemonades! My favorite frozen treat is ice cream. My favorite frozen treat is homemade ice-cream! I like fruit sorbets in the summer. I like frozen grapes and frozen bananas. I love dairy queen icecream! Homemade ice cream that gives me a tension headache. Worth it! I love fudgesicles, ice cream in any shape and frozen fruit bars for the extra refreshing treat. Italian ices and frozen fruit bars are my favorites. I ate the strawberry today (95 degrees here). I want to try the pineapple. I love banana flavored popsicles! For me, it’s a scoop of baskin robbins daiquiri ice sorbet! Cotton candy flavored ice cream from Baskin Robbin’s in my favorite. Thank you! Ice cream is my favorite frozen summertime treat. I love sorbet in the summer, especially coconut or mango sorbet! yummers! Snow cones in the summer are great! try the acai blueberry, delish. My favorite frozen summertime treat is the strawberry outshine mixed with mango juice. anything frozen is good – we do more popsicles like outshine bars in summer and scoop ice cream in the winter. 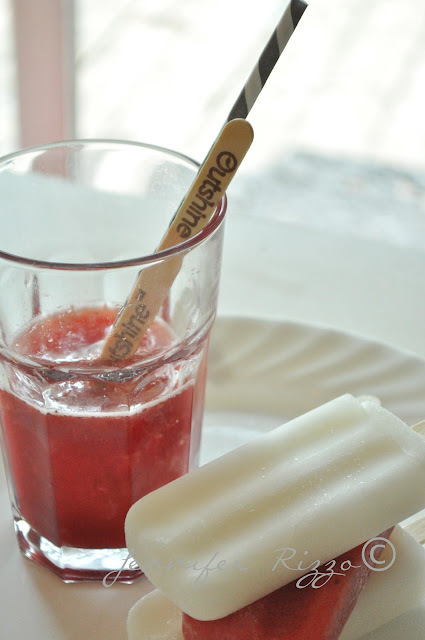 really enjoyed putting an outshine strawberry bar in a glass of OJ and having the juice freeze in a layer on the pop! Isn’t the sugar a little high for this treat? Not if it’s a treat,not a snack. it’s all about moderation! 🙂 .. I love outshine bars as a cool treat! I love homemade ice cream made with fresh fruit. A strawberry margurita made with Outshine sounds devine! Perrys peanutbutter cup ice cream! Coconut outshine bars, definitely! LOVE them. I love the Outshine Bars and so do the kids. It’s easier on the tummy than ice cream especially on the super hot days and we can do so many different things with them. we love to melt and mix them as well as eating them frozen! Yum! 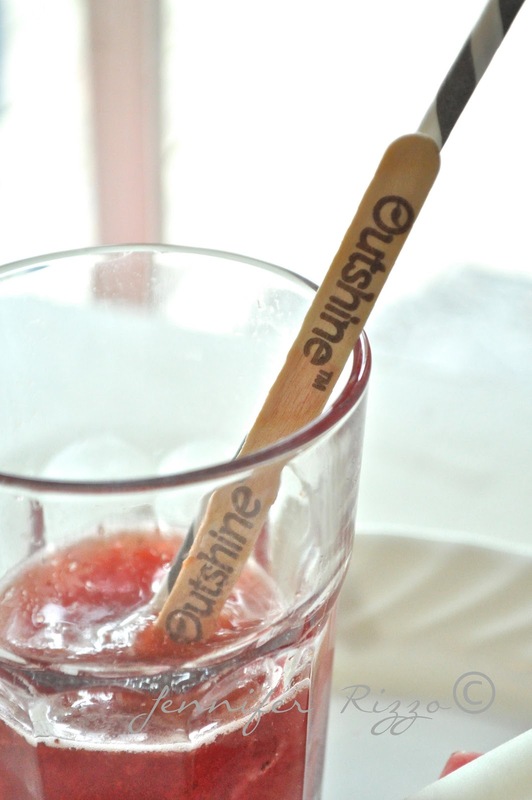 Nothing more refreshing than an Outshine Bar on a hot day!!! Summer time means frozen anything. Outshine bars are definitely on that list & now thanks to Jennifer’s suggestion, I’ll be keeping some in the freezer year round for cocktail time. Ice cream is my favorite summertime treat. Frozen fruit bars. The Outshine bars, of course. Ice cream has always been too heavy for me. I love it all! Ice cream, popsicles, slushies, smoothies, you name it! I love green tea gelato!! I think it’s sooo delicious!! Ok, now I can’t stop thinking of Outshine drinks. I am going to get Coconut and mix it with some Kahlua & Chocolate liqueur! I love fruit smoothies that I make. I love an ice-cold lemonade on a hot day.